Alan Thicke was an iconic Canadian-born multi-talented entertainer. During his career, he mastered the art of presenting, acting, comedy, screenwriting, writing, composing, songwriting as well as hosting of ceremonies. He is best known for his role on Growing Pains, an ABC Family Sitcom where he played Dr. Jason Seaver. Apart from his role on Growing Pains which ran for a total of seven seasons, Alan made several appearances in several movies including Alpha Dog, Copper Mountain, Stepmonster and Carolina. He was also part of the American television series – Hope and Gloria, where he played Dennis Dupree. Over the years, the actor has appeared in several television shows including How I Met Your Mother, Celebrity Wife Swap, Murder She Wrote, Married…With Children and Scream Queens. The legendary actor also established his own shows – Thicke of the Night and The Alan Thicke show. Alan Thicke certainly built a rather impressive career for himself over the years and it is a shame the world lost such a talented actor pretty early. Alan Willis Jeffrey was born in Kirkland Lake, Canada on the 1st of March 1947. He is of Canadian nationality but with mixed Irish, Scottish and English ancestry. His biological father was William Jeffrey – a stockbroker while his mother – Shirley Jeffrey earned a living working as a nurse. When his parent’s marriage came to an end in 1953, his mum got remarried to a physician named Brian Thicke. The young Alan grew up in Elliot Lake alongside his half-brother, Todd Thicke and half-sister, Joanne Thicke from his mum’s second marriage. Talking about the multi-talented entertainer’s educational background and qualifications, he achieved his secondary education from Elliot Lake Secondary School. During his years at Elliot Lake, the young Alan was chosen as homecoming king, graduating in 1965. He proceeded to the University of Western Ontario where he joined the Delta Upsilon fraternity. Taking a look at the late actor’s personal life, Alan Thicke was married three times. His first foray into matrimony was with Gloria Loring, a popular actress best known for her role in Days of Our Lives. Their married life began in 1970 and was sustained until 1984 when they made the decision to end their union. After a couple of years, Alan started a relationship with actress Kristy Swanson when Kristy was just 17. Though the pair got engaged, they never officially tied the knot. Alan’s second marriage was on the 13th of August 1994 when he wedded the 1990 Miss World Gina Tolleson. Sadly, that union ended in a divorce on the 29th of September 1999. His third marriage, which took place in 1999 and lasted till his death, was to the model – Tanya Callau. The two met in Miami where Tanya was working as a model with Alan as a celebrity host. Alan Thicke had two children from his first marriage to Gloria; his son, Brenan, grew up to become an actor and the other son – Robin Thicke, became a successful R&B singer. His second attempt at marriage with Gina produced one child – Carter Thicke, who was with him at the time of his death. The iconic entertainer amassed an impressive total net worth of $40 million during his long and illustrious career. Although the salary he earned was never published, it is believed that Alan’s wealth was accumulated through his work in movies, television series as well as his involvement in shows. 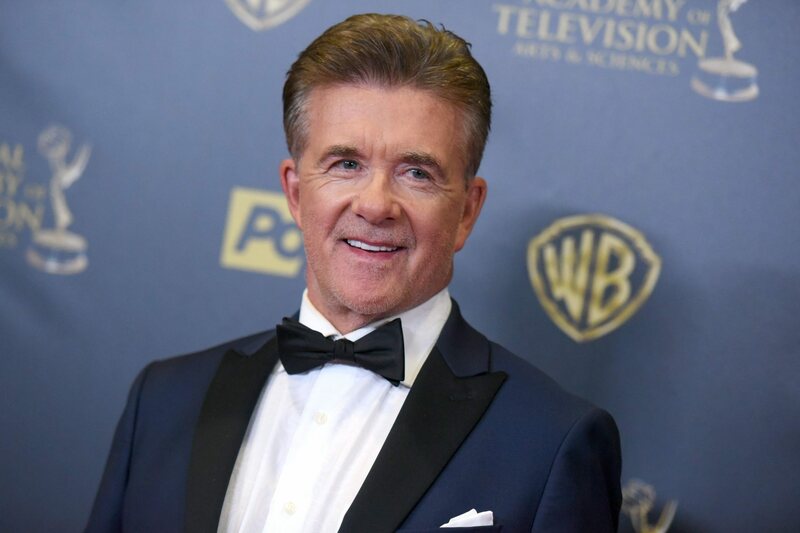 Alan Thicke was at Pickwick Gardens in Burbank, California, enjoying a game of ice hockey with his son Carter on the 13th of December 2016, when he suddenly fainted. According to the rink manager, the legendary entertainer was still conscious enough to crack a joke with his son to capture him on camera as he was wheeled out on a stretcher. Alan was later confirmed dead at the Providence Saint Joseph Medical Center Burbank, aged 69, the cause of death was later discovered to be type-A aortic dissection. His interment took place at the Santa Barbara Cemetery in Santa Barbara, California on the 19th of December 2016. It served as a good opportunity for the cast members of Growing Pains to reunite. His friend, Bob Saget, gave him a befitting eulogy while his son, Robin, offered a humorous story in remembrance of the iconic actor.